Tagged as: active learning classroom, Kara Dawson, Lynda Hayes, P.K. Yonge Developmental Research School, Steelcase Inc. Inspired by the early impact of P.K. Yonge Developmental Research School’s new, state-of-the-art elementary wing, faculty researchers from PKY and the University of Florida are teaming up on pioneering studies into how school building design can influence and improve schooling for both teachers and students. P.K. 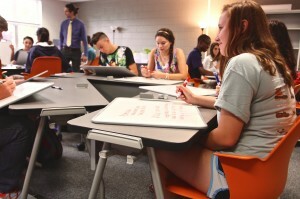 Yonge faculty researchers, led by school Director Lynda Hayes, are partnering with UF’s College of Design, Construction and Planning on a two-year study funded by Steelcase, Inc., the world’s largest office furniture manufacturer. The team also includes UF education technology Professor Kara Dawson. Steelcase has refurbished and furnished a designated “active learning classroom” in the school’s older high school building with up to $50,000 worth of furniture and integrated technology and is training school instructors in the use of the active-learning tools. P.K. Yonge has been the UF College of Education’s laboratory school since 1934, serving as a center of innovative educational program development and dissemination for kindergarten-through-high-school students throughout Florida and beyond.